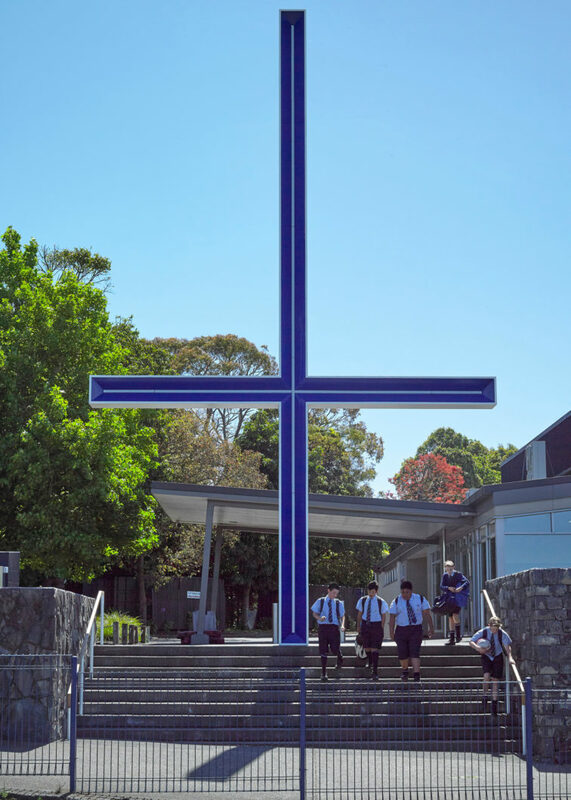 St Peter’s College approached us to revamp their previously unceremonious pedestrian entry into what is the largest Catholic Boy’s School in New Zealand. Initially asking for a new gate and improved stairs we took the opportunity to develop the notion of a gate into a spiritual and conceptual threshold for the students to pass through each day, and to have the gate express to the passer by something of a statement of purpose. The most potent and recognised symbol of Christianity is the cross. As a symbol of atonement it provides hope and inspiration to the faithful.In Catholic history Saint Peter was one of the twelve apostles, and is regarded as the first Saint. It is traditionally held that he was crucified upside down at his own request, since he saw himself unworthy to be crucified in the same way as Jesus.This understanding led us to design a large-scale Christian Cross, inverting it to deeply personalise the cross to Saint Peter and St Peter’s College. Passing under this great cross one is reminded of Christian faith, the calling of the College and the highly specific connection to St Peter. 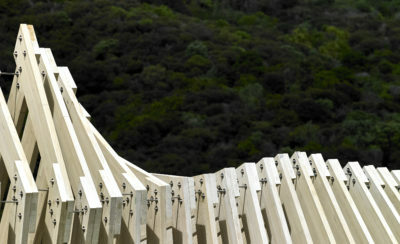 Utilising local structural steel technology to customise a standard UC section, and mirco-pile technology to cantilever the 11.5m high structure the cross is a simple but powerful gateway for students, staff and visitors to the College yet serves also as a strong statement of Christian Faith to the outside world.